Sqrxz – Page 2 – Sqrxz by Retroguru – Mindblasting frustration deluxe! More Sqrxz 4 & Official Trailer! Thanks to Scott Smith aka Pickle we now do have ports of Sqrxz 4 for Openpandora, GP2x and Caanoo. Please get the downloads from the Sqrxz 4 page. 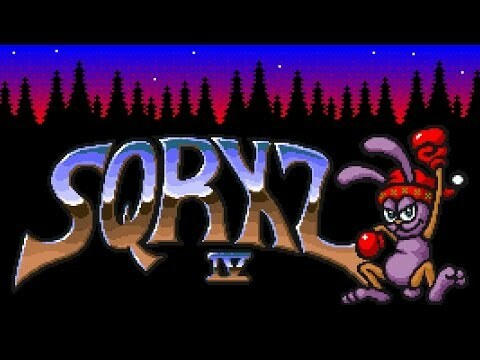 Denny Müller aka Mulle, Chief Trailer Officer, of Retroguru finalized the official Sqrxz 4 Trailer, please find it here. We have just released Sqrxz 4 – Cold Cash! Available for Windows (32-Bit), Linux (32-Bit, 64-Bit), Wiz, PSP, MotoMagx, Dreamcast, GCW Zero, MacOS X (32-Bit, 64-Bit) / Intel and Raspberry Pi! Temporary download from here. Thanks a ton to all involved Retroguru members! Especially Rodolphe Boixel (Thor), Simon Butler, Jan Jensen (Flarfy), Johan Letfors (Vedder) and Alexander Wiklund. Certainly not to forget our porting machines responsible for the initial ports: Frank Wille (phx), Lars Persoon (anotherguest), Artur Rojek (zear), Xavier Vallejo (Indiket), Sergei Kolesnikov (exl) and James Higgs (Jum). Trailer and own Sqrxz 4 webpage as soon as we come back from Revision 2014. Let us know how far you can get and share your progress with us! Hate mails, love mails, donations – everything welcome! The gamedev competition at Revision 2014 had 10 game entries, few of them were fine, few of them were not. We update you as soon as results are out! To Sqrxz, or not to Sqrxz! Sqrxz 1 Amiga OCS v1.2 is out! We are happy to announce Sqrxz Amiga OCS v1.2 – please go ahead and find it in our download section! As many people mentioned the wish to play with a gamepad, Frank Wille spend a lot of efforts to make this possible. Furthermore we now offer a CDTV/CD32 image of the game. Look forward for the release of Sqrxz 2 Amiga OCS v1.0 next week! Please kindly note that Sqrxz for Amiga OCS/ECS has been updated. We are now on Version 1.1 which comes with improved scrolling and improved music player. Along with this, there is a HD installable download too! A CDTV/CD32 version will follow soon as we need to update it, to be in sync with the latest release. 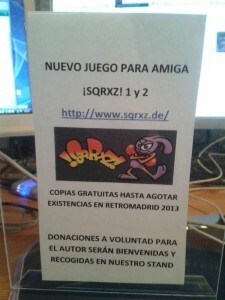 Sqrxz Amiga OCS released at Demodays 2012! 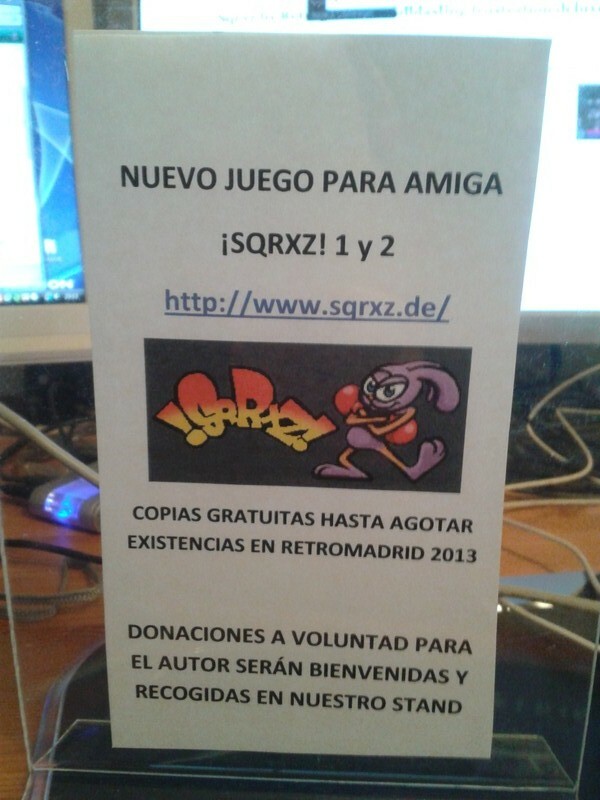 We’ve been at Demodays 2012 and released Sqrxz for Amiga OCS. Yes, for the good old original Amiga’s and on good old floppy disks. The game has been tested on Amiga 500 but also works without problems on AGA Amiga’s such the Amiga 1200. Frank Wille, our Amiga OCS guy, sent out 40 floppy disks with the game. Shahzad Sahaib, our project manager, brought 31 floppy disks to the event. 11 floppy disks were sent out for marketing reasons. So as of now there are 82 floppy disks circulating. We will upload an official image within the next two weeks. We plan to release more floppy disks, depending on the feedback we get. If everything goes smart, we will announce here and on our Facebook page, on which events (demoparty or event with retro topic) you can pick up your personal copy. Donations are welcome, but not necessary. Sqrxz v0.9.9.6 for AROS is out! Thanks to Yannick Erb we have Sqrxz ported for AROS. Thanks to Nikolaos and Bobo for pre-testing the binaries! Head over to the download section for the file! Porting Sqrxz to Android is in progress. As only one person in the team has an Android device, getting the game out in playable state might take a while. Sqrxz v0.9.9.6a for Amiga OS4 fixed! We had a wrong file uploaded for Amiga OS4 users, please re-download. Thanks!